This is one of my favorite posts to write every year. 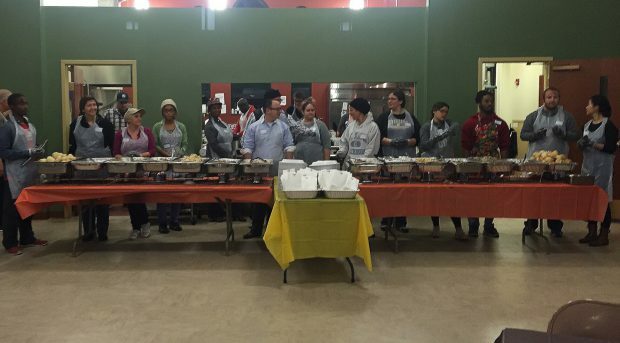 Six or seven years ago, an old friend posted on Facebook that volunteers were needed to help cook and serve a Thanksgiving-Eve meal. I showed up and helped to wash some dishes and I have gone back to volunteer every year. You can read my Facebook post from November 26, 2014, it is probably the best summary of my experience. 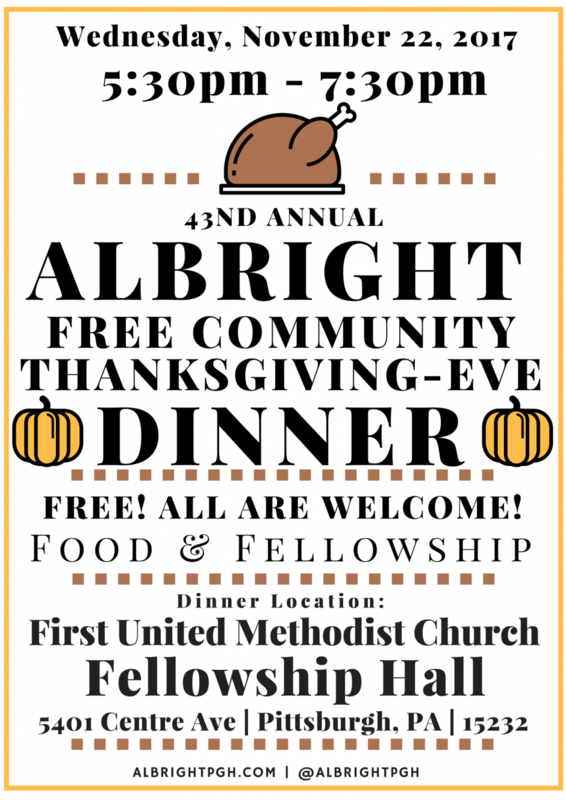 The congregation of Albright has been hosting this free meal for 42 years. It is a big old Thanksgiving dinner, turkey, stuffing, and all of fixing. The meal is prepared by volunteers and served to anyone who needs a hot meal and some fellowship. It is hard to summarize in a few sentences, but it just all works. Neighbors come together every year to make sure that other neighbors have something to eat. When there are enough leftovers, most people leave with a take-out box of something to eat the next day. There are 3 ways you can help make sure this years Thanksgiving-eve dinner is a success. Sign up for a volunteer shift! Volunteers are needed Wednesday to cook and serve the meal. All are welcome to help. This dinner is a massive undertaking, the Albright congregation has it down to a science and with volunteer help, the entire meal comes together and dinner is served.Sign up to help here: https://goo.gl/forms/kiWBAxOllSjclKvx1.Volunteers will be needed all day on Wednesday. Children who are accompanied by a parent are welcome to help. Make a Donation. Contributions can be made on 2017 Albright Thanksgiving Dinner GoFundMe page. Last year 24 people donated to the cause.I’ve set a personal goal of having 50 different people donate to this year’s dinner, which is double the number of donors from last year. As of today, 40 people have made a donation to the dinner. We have raised enough money to cover the basic costs, but it would be great to raise a little bit more so we can make sure we have enough food for anyone who shows up. (Donations are made to New Sun Rising which serves as the fiscal sponsor for Friends of Albright). Spread the word. Please invite your friends to help and attend the dinner. You can share this Facebook event page and the posted included below.